We're the nation’s largest network of audiology and hearing healthcare professionals. Two constants in our industry have been changes and challenges. Whatever the future may hold, rest assured that Consult YHN’s programs and services will keep you focused on helping individuals hear well. To continue helping people hear well, you need to connect with those who need your assistance! Together, we will develop a comprehensive lead generation strategy to reach those who may not know they need your support and keep your practice top of mind among potential customers. Your customer’s relationship with your practice determines whether they will walk in your doors, buy a hearing device, and return for future screenings. Our proven methods help you create happier customers and leverage that relationship to close even more business. No two words currently evoke as much anxiety among healthcare providers as “managed care.” The truth is that managed care does not need to be difficult or stressful. We can make the challenge of balancing your private pay patients with managed care customers much less daunting. Although big-box retailers are formidable, they are NOT all-powerful. Just as the big boxes are known for certain things, we work with you to focus on what your practice does best. Let’s find your unique value proposition and utilize it to better position your business for success! To compete with online sales, you must establish a digital presence of your own. An effective online footprint communicates your unique value proposition, presents your brand, and begins the customer experience! We ensure your digital marketing strategy will resonate with online audiences. "Consult YHN keeps me relevant and competitive. That is why I have been with them for 20 years." "I love helping others, but I had no idea what I was doing when it came to the business of being in business. Consult YHN helps me make sense of the business side of my practice." "I'm a believer in Consult YHN. Without them, I wouldn't be where I am today. We all need someone who can offer guidance. Listen to them. They know what works!" The Consult YHN community is comprised of like-minded, high-achieving hearing healthcare professionals who are dedicated to taking their practices, and their careers, to the next level. We understand the delicate balance of delivering optimal patient care while also managing every facet of your practice. We help you build a strong foundation for success based on three principles: understanding your needs, developing a plan, and managing your success. We provide you with the tools you need to put your business plan into action — our robust suite of resources and solutions can be tailored to meet your practice’s unique needs. Beyond the expectation to provide the highest level of patient care, as a multi-specialty ENT you are tasked with increasing your practice’s profitability and maximizing revenue. Our ENT focused professionals possess expansive industry knowledge and a track record of proven results. By leveraging our expertise, we’ll help you identify, then improve, the areas of your practice where you will realize the most value. From a business analysis designed to capture the advantage of your existing patient base to the development of a customized staff training plan, we will work with you every step of your journey. Increasing revenue generation in the complex environment of a hospital-based clinic is hard enough — yet, you need to do it while also maintaining the highest level of hearing healthcare. We will help you lay the groundwork for success with access to easy and efficient consolidated billing and ordering, customized training, and a powerful suite of tools designed for your unique needs. Interested in joining Consult YHN? Download our hospital and university application form. Are you a specialist interested in extending your practice and maximizing your revenue? Our staff of business experts can help you realize your full potential and become a multispecialty provider by adding hearing healthcare services to your patients. Our Managing Business Activities (MBA) program offers a venue for learning and sharing between peers. Attendees gain a deeper understanding of the operational and financial status of their practice as well as a strategic plan for sustainable revenue growth. We continually adapt to meet the rigorous demands of an ever-changing industry. The process we’ve developed keeps our Associates ahead of the curve in this competitive market. We have been optimizing audiology practices for over two decades. You can trust that we know what works and what doesn’t. Call us at 800-984-3272 to discover your practice’s full potential! Hearing aids is just one element of what we provide to our Associates. Your job is to restore and preserve hearing – our job is to help you reach as many patients as possible. Here are a few ways how. Creating an office culture that is capable, confident, and collaborative increases the success of your practice. Through the application of our proven best practices, All The Right Things,™ daily duties are transformed into a strategy that focuses on patient care and business growth. Account Managers are your personal practice specialists, dedicated professionals, and liaisons to our services. They provide business development support, professional improvement resources, onsite staff training and assistance across the entire scope of your practice, as much or as little as you see fit. Our MBA program is designed to help you bridge the gap between where your practice is and where you want it to go. Together, we will design a strategy to grow your revenue by 20% and multiply profitability by 30%–all within just six months! Navigate difficult situations and manage employees more effectively with our information-rich resource portal. Access to federal, state, and general HR help is just a click away. Full lifecycle staffing support helps you fill positions in audiology, device fitting, office management, and business development. Your one point of contact to screen, interview, negotiate, extend offers, and close on new employees. Our insightful tracking, analyses and reporting solutions boost productivity. With more than 20 years of experience in optimizing audiology practices, we will benchmark your progress and provide effective systems, tools and dashboards developed to make your practice more productive. Businesses like yours must take advantage of the many different marketing channels available, both traditional and digital. Together, we’ll enhance your brand image, attract potential patients, and increase your visibility in the marketplace. Participate in employee development programs — onsite or locally — with training for audiology and front office staff, operations managers, and other key positions. Realize the benefits of joining the Consult YHN network almost immediately. Spend your time helping patients instead of placing orders and tracking shipments. Your Hearing Network is a managed care, third-party administrator that provides free access to managed care patient referrals. 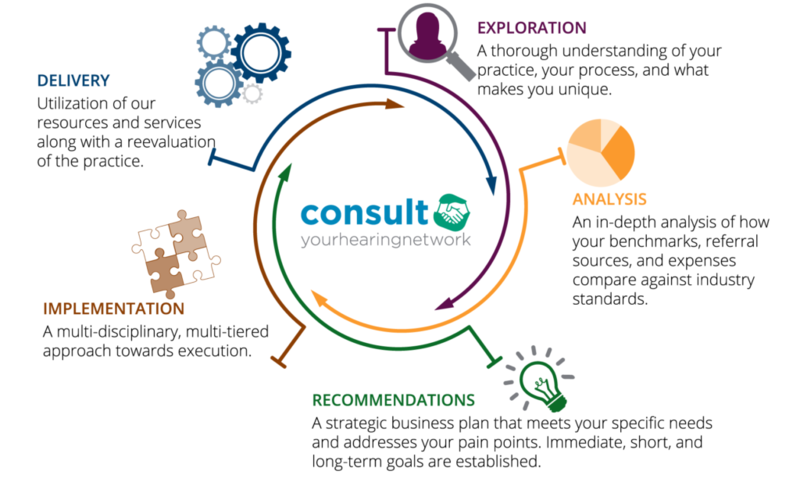 Consult YHN has created the nation’s leading network of hearing healthcare professionals by partnering one-on-one with medical professionals to drive growth and help more people hear well. Founded in 1995, Consult YHN membership uniquely separates quality providers from all others across the nation.